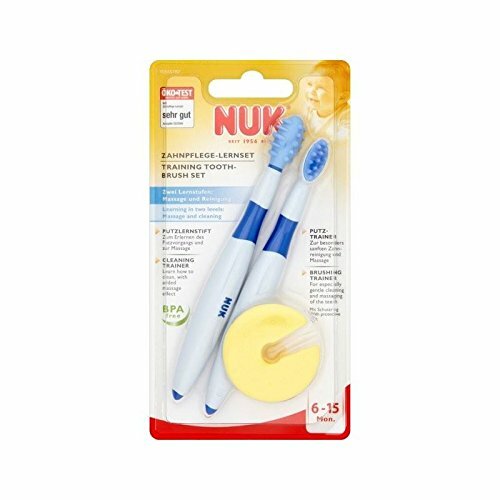 The NUK Training Toothbrush Set is designed to clean baby's first teeth and at the same time get them used to the feel of a toothbrush in their mouth. The set includes 2 x toothbrushes: a starter toothbrush which is designed to be chewed by babies aged 6mths+;the chewing action gentle cleans baby's gums and palate. The second brushing trainer toothbrush is designed for older children;it helps them get used to the feel of a brush in their mouth whilst gently cleaning their sensitive first teeth. For safety both brushes feature a protective ring that prevents the brush being pushed too far into the mouth, the protective ring can also be used as a handy brush stand.